For today's Inktober challenge, I decided to explore line weights, or how thick to thin lines are using various pens. If you have spent any time watching anime or tried to draw manga-style characters, you've seen the effect of line weights (though you may not continually be aware). Manga and anime artists use thick and thin lines to add depth and texture to their drawings. I have also seen urban sketchers like Marc Taro Holmes and Liz Steel use pens with different weights to draw gesture lines and add depth to their sketches. Usually when I draw, I use a single pen. 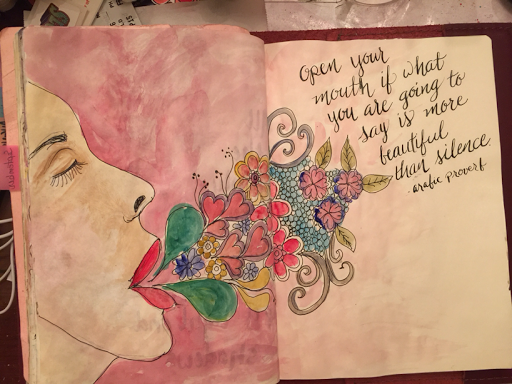 I tend to use color and other media to add depth and texture. My favorite pen to use is the Platinum Carbon Pen. It is super fine and is very durable. It can also be used over gesso which is nice. And it is relatively cheap. The ink is waterproof so you can watercolor over it. My next favorite are Preppy Pens in .02 and .03 widths. The ink that comes with these pens are NOT waterproof but the Platinum carbon ink cartridges will fit in them, Score! I love Microns too but I'm so rough with my pens that I tend to ruin then too quickly. Recently I purchased the Pentel Pocket Brush Pen for hand lettering. Brush pens require lots of practice to get the thick and thins to work together, and I'm practicing! It is also waterproof so it works well with watercolor a too. 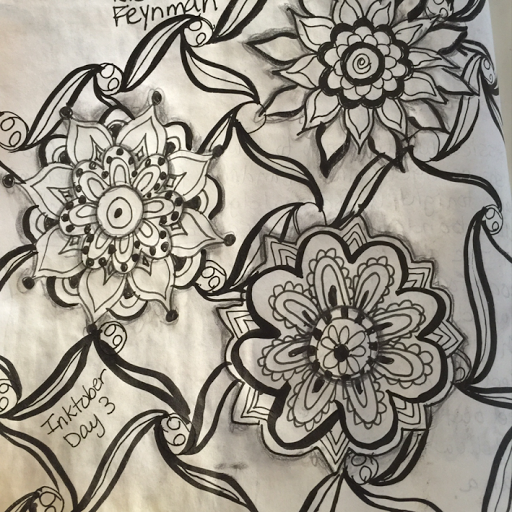 For today's Inktober entry, I went with mandalas and tried to use different pens to create them. 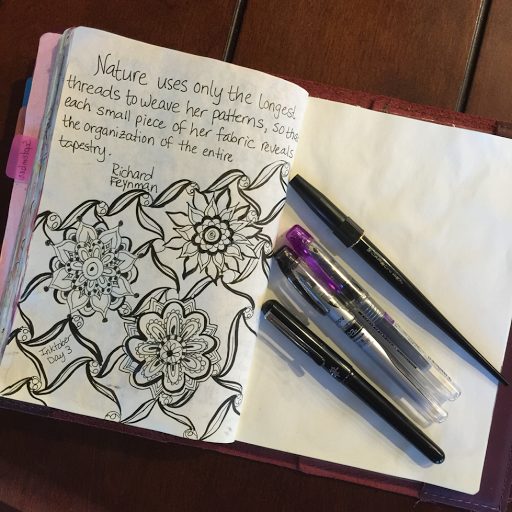 Mandalas and zentangle are wonderful to create complicated-looking patterns that are fairly easy to create. And I've always used a single pen to create them and added pencil shading to create depth. This was an interesting exercise for me to think about which pens to use. And though the differences in weight among my fountain pens are slight, the lines created by them give the drawing some depth. I've always been attracted to black and white- not too sure why it just draws me in. Love your day 3 image- i had to look hard to figure out if it was flat or not! And I love the proverb with the flowers- would love something like that for a Clean promo- hint hint LOL!! !